There was nothing wrong with the seats inside the train – they were plush and luxurious with massive panoramic windows and hostesses serving gourmet food and champagne. We had paid a premium for the seats ... but we never actually sat in them. We spent the entire 2½t hours from Samedan in Eastern Switzerland over the Bernina Pass to Tirano in Northern Italy standing in an open carriage at the rear of the train, lurching from one side to the other, spellbound by the staggering landscape and the utter perfection of the cloudless, autumn day. 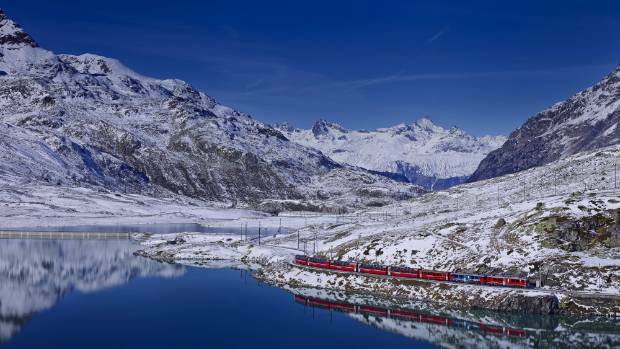 My heart rate started to ramp up as soon as the bright red Rhaetian Railway locomotive with the Bernina Express sign slid into the station in Samedan, hauling a string of panoramic carriages which looked like glass capsules. In fact, my pulse began to accelerate early that morning when I opened one eye and peeped through the curtains in our Bever Lodge bedroom to discover the eye-wateringly bright blue sky and the silver veneer of frost on the grass. I had been planning this UNESCO World Heritage train ride for years and to strike a magic day like this in late autumn was beyond belief. A smartly-attired Bernina Express hostess met us on the platform and showed us to our deluxe seats. On a cold, snowy or rainy day, travelling in comfort in the warm, panoramic carriage with huge windows that extended along and up the walls and across the roof would have been the ultimate in luxury and scenery-viewing. But that day, the carriage was nearly-deserted. Reading my mind, the hostess pointed to the rear of the train. "Everyone is in the open carriage today ... because of the beautiful weather. "There were a handful of passengers in the wagon-like carriage which had hard wooden bench seats and no protection from the elements. "Ahh, perfect," I thought, as I scoped out the scenario for manoeuvreability and photography. "Nothing to stop me from swapping sides at will depending on whether the primo sights are left or right, less chance of trampling anyone who gets in the way and no glass reflection." The problem was the primo sights were everywhere on this trip. We set off along the valley directly below the magnificent Panoramaweg, a 7km alpine pathway from Muottas Muragl to Alp Languard we had hiked the previous day. The wagon was noisy, blustery and far from comfortable, positively Spartan in fact, but I was so happy. Golden autumn foliage crept up the mountain sides swallowing up the dark green conifers. 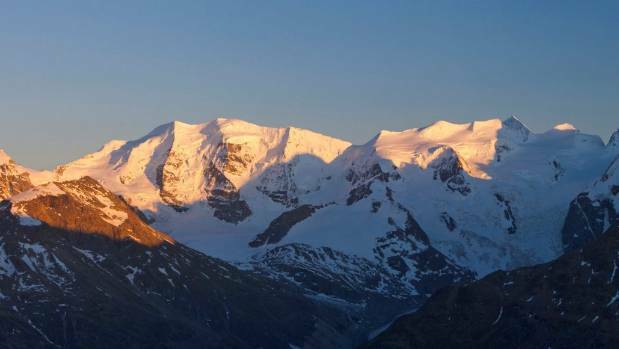 The spectacular, pure white Bernina Massif shimmered on the horizon like a mirage in the morning sunshine. It was astonishing to think our train was about to climb over this high alpine pass and end up in Italy. Such things are huge novelties for Kiwis. As we got closer, I nearly fell out of the carriage trying to get the perfect shot of the mighty Morteratsch Glacier and 4048m Piz Bernina towering regally above. 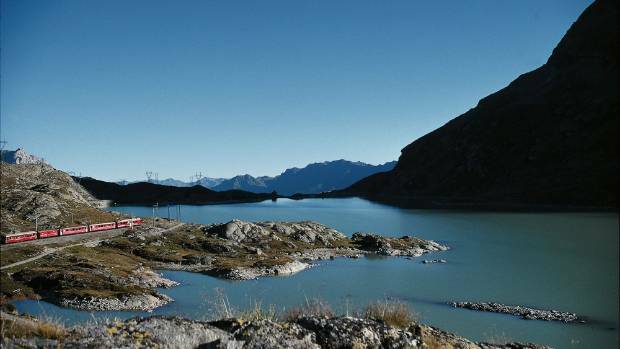 Near the summit of the pass lay the beautiful twin lakes of Lago Bianco (White Lake) and Lej Nair (Black Lake) named for their pale aqua and ink blue colours. Rivers flowing from the lakes head off in opposite directions – the Nair tracks northwards to the Inn and Danube and ultimately the Black Sea, while the Bianco flows south to the Adda and Po and the Adriatic. Glacier tongues reached down towards the lakes, waiting for the winter snow and ice to replenish and reunite them. At Ospizio Bernina, 2253m above sea level, the highest point on the trip and the highest altitude station on the Rhaetian Railway, I was in a state of euphoria, perhaps a little light-headed with the altitude. I was entranced by the strongly contrasting colours of the landscape - the intense, infinity blue of the sky; the blinding phosphorus of the sunshine; the pale, milky green of Lago Bianco; the dazzling white snow against the dark, muscular torso of the rocky massif. Ospizio marks the boundary between the Italian-speaking valley of Val Poschiavo and the Swiss Engadin valley where the inhabitants speak Romansh and German. From there we skirted the shore of Lago Bianco and began our long descent. Being in an open carriage at the back of the train, I could watch the massif slowly recede into the distance. Soon after, we stopped at Alp Grüm, 2091m, built in 1923. The old stone station houses a lovely restaurant and hotel where white duvets were airing in the windowsills in typically-Swiss alpine fashion. The passengers piled out and gazed around in wonder at Palü Lake, an exquisite turquoise jewel fed by melt waters from the glacier beneath Piz Palü. Hiking and biking tracks leading towards the glacier were dotted with hearty, fit-looking, older couples who waved out to us. I heard a yodel in the distance. I had an insane desire to abandon my Lake Como plans and join them. Such thoughts make me feel traitorous to my Kiwi homeland but Switzerland's mountains and glaciers are higher, craggier, snowier and so much more accessible than ours, thanks to the incredible network of mountain railways, cable cars, gondolas, tracks and lodges. And there are so many more mountains. Wherever you go, the horizon is literally bristling with peaks. A keen tramper, the alpine lodge high on a ridge above beckoned to me. Next time, I promised myself. Back on the train, I was caught off-guard by the same wrenching sensation I experience whenever I leave Central Otago, my turangawaewae. I felt an acute sense of loss as the mountains slipped away. Tears dribbled down my cheeks and a Swiss woman put her arm around my shoulder. She obviously understood the allure and magnetism of the mountains. I later discovered she was a friend of a friend from Wanaka. I had no time to wallow in my 'will-I-ever-be-back-in-the-Swiss-alps?' emotions though. The drama and excitement of our 1824m descent to Tirano soon flooded my consciousness and obliterated any sadness at leaving the mountains. Despite the fact we were still in Switzerland, the landscape, architecture and place names took on a distinctly Italian-Mediterranean flavour as we descended to Poschiavo with its graceful palazzi, church spires, hillside vineyards and lovely Lago di Poschiavo, a mirror encircled by a necklace of mountains. The atmosphere was different too – the clear, sharp, light and cool, dry air of the high Swiss alps was replaced by the soft, diffuse, golden haze and warm, velvet air of the Italian lakes' district. The pièce de résistance on the downward leg was the Brusio Circular Viaduct, a truly remarkable engineering masterpiece which allows the train to lose height within a seriously short distance and confined space. The track has a maximum grade of 7 per cent so the train does not slip on the way up or lose control on the way down. Opened in 1908, the 360-degree, 110m spiral viaduct is a jaw-dropping sight. The train corkscrews on a track supported by nine stone pillars that steadily decrease in height. At one point the front and the back of the train nearly overlap. When the locomotive reaches the valley floor, it leads the train between two of the support pillars while the tail end is still on the viaduct above. Rather snake-esque. 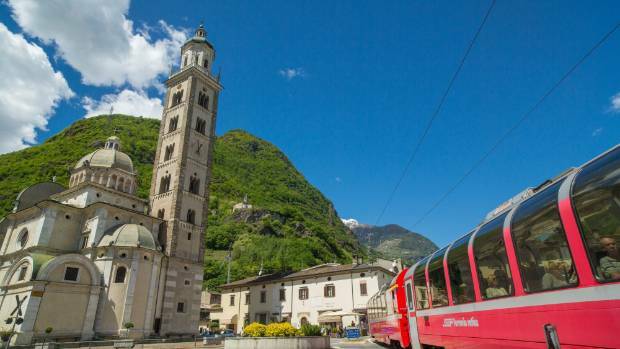 About 15 minutes later, the train crossed the Italian border and trundled self-importantly down the main street of Tirano, (429m), taking up the entire road. What a grand entrance and a suitably dramatic finale to an extraordinary expedition. When the train came to a standstill, I was exhausted but exhilarated. I was experiencing massive sensory overload. And the fact we were outside, exposed to the elements and the noise of the train during the entire trip made the experience even more intense and physical. It was the least relaxing, most physically and emotionally draining train trip I've ever done. I didn't eat, drink or visit the bathroom for fear I'd miss something. Even blinking was risky although there were times when I wanted to close my eyes and ears to rest them from over-stimulation. The enormity and beauty of the landscape were overwhelming. 'Aren't we the lucky ones,' I said to myself and then out loud several times as if to convince some stony-faced passengers that they had just been to heaven and back. Breathless, bedraggled and bewitched, I must have looked a little unhinged. I went inside and sat in my expensive seat for five minutes, allowing the impact of the experience to settle into my consciousness. I was also not quite ready for the culture shock of moving from efficient, punctual Switzerland to romantic, seldom-on-time Italy. Had the opportunity presented itself, I would have happily stayed on the train and completed the same trip in the opposite direction. When the hostess came to politely evict me from the carriage, I asked if she ever tired of the trip. 'Any hostess jobs available?' I asked. 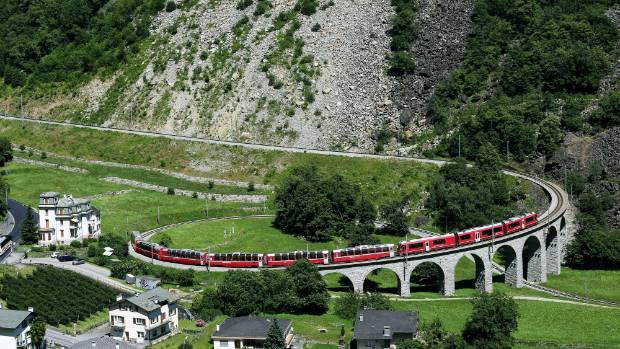 *The full Bernina Express journey from Chur (593m above sea level) to Tirano (429m above sea level) takes four hours and covers a distance of 122 km of track including 55 tunnels and 196 bridges and viaducts. The top elevation is Ospizio Bernina, 2253m above sea level. 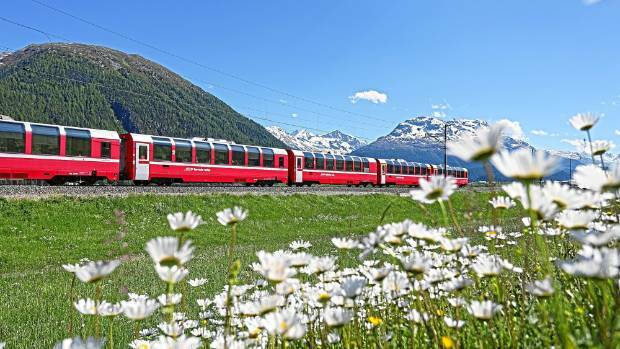 *The writer travelled courtesy of Switzerland Tourism and Rail Europe. Written by Justine Tyerman. Republished with the permission of Stuff.co.nz.